Artwork Panel: 32.1cm x 65.8cm ≈ 12½" x 26"
Silk/Brocade: 41.5cm x 127cm ≈ 16¼" x 50"
This directly means heart in Vietnamese. However, because it was believed in East Asian culture thousands of years that your consciousness and thoughts came from the big red organ in the middle of your chest, it also means "mind" or "spirit" and sometimes even "soul". 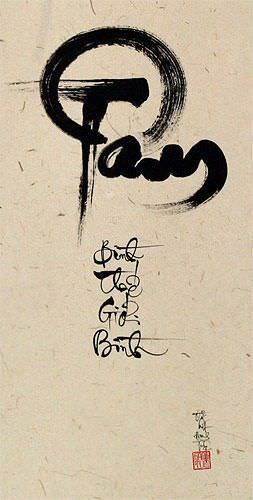 In modern Vietnamese, it's written "Tâm". It was originally written in Vietnamese as 夢 before romanization. Ven. 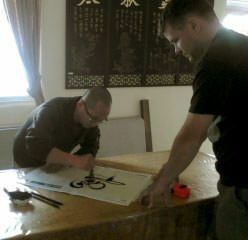 Chat Nguyen paints special Vietnamese Buddhist calligraphy at the local temple. The artwork was painted on handmade xuan paper. The raw artwork was delivered to my art mounting shop in Beijing. There it was built into a completely handmade wall scroll by a skilled craftsmen. Ven. 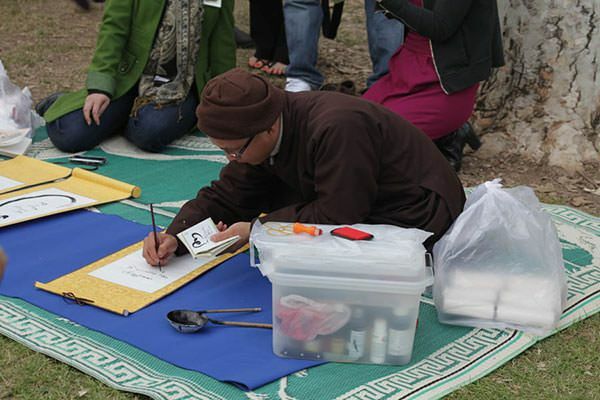 Chat Nguyen painting calligraphy in the park during a festival. I met Vietnamese Buddhist Monk, The Venerable Chat Nguyen, in 2012. At the time, my San Diego studio and gallery was just around the corner and 8 blocks away from the Vietnamese Buddhist temple. Ven. Chat Nguyen came to me one day, asking for some blank wall scrolls. He had plans to do some live calligraphy paintings at an upcoming festival the temple was having for the community. 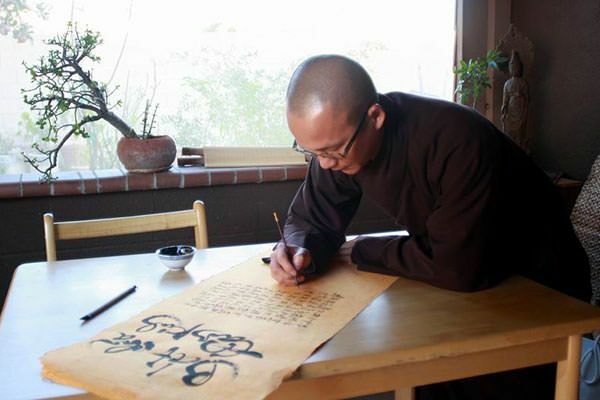 Knowing that renounced Buddhists do not handle money when they can manage to avoid it, I suggested we do a trade of blank wall scrolls in exchange for some Buddhist calligraphy that I could sell on my website. The scrolls he accepted were used to raise donations for the temple. The ones I sell here help to offset the cost of those scrolls (and put food on my family's table). It's a win-win, as your purchase supports the Chùa Phật Đà temple, and you get some very unique Vietnamese calligraphy. For a long time, the Vietnamese language was written using Chinese characters. These are known in Vietnamese as chữ Nôm. Each Chinese character represented a word. Many Chinese sounds were incorporated into the Vietnamese language over the centuries, so many words have similar root sounds between the two languages. This is especially true of Buddhist words and titles. This is because the flow of Buddhism came from India, through Tibet, and China, then arrived in Vietnam directly from China. In the late 1500's and through the 1600's, Jesuit missionaries from Portugal and France created Romanized versions of Vietnamese sounds to teach newly-arriving missionaries how to speak the language. The effort was innocent enough, but things changed in the 19th century. The French were now ruling much of Indochina. Both missionaries and French rulers wanted to suppress Confucian thought, and influence of Chinese culture on their Vietnamese subjects. By 1917, Chinese characters were virtually banned in Vietnam. The Romanization scheme left some lingering problems for Vietnam. There are many homophones in the Vietnamese language, for which the meanings can be established by the context of the conversation. However, when Vietnamese was written in Chinese characters, any text made it obvious which word was being used. However, it can be very confusing as the romanized versions are written exactly the same. If you know your history, there was much resentment for the French colonizers in Vietnam. This forced change to a Romanized written language was a point of contention for many Vietnamese. Of course, this was not the only reason that many Vietnamese people rose up against the French.